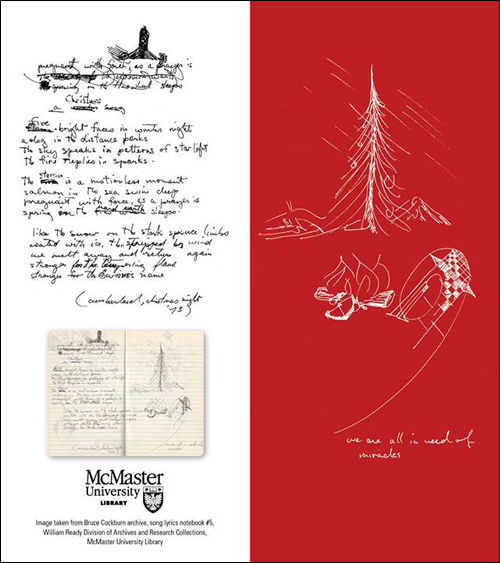 Here's a beautiful Christmas card that McMaster University Library has made from two pages out of one the many notebooks that Bruce has donated to the University. It's made from Bruce's original hand written lyrics and drawings (which they neatly show on the card) for Christmas Song which he wrote on December 25, 1973. The tune later appears on his 1974 album Salt, Sun & Time. The McMaster Library will be sending out this card to their various friends and associates. Their art department has done a wonderful job in my opinion. We thought you might like to take a look at this.